Wholesale Drawstring Gift Bags - Bulk Gift Bags - Quality Bags & Fast Delivery! State Line Bag Company is the #1 source for wholesale drawstring bags with more than 1,000,000 bags in stock. Bulk gift bags are shipped same day on orders placed prior to 1 p.m. Central time, and super-low pricing make us an industry leader for high end drawstring gift bags. State Line Bag Co. enjoys the business of countless repeat customers due to our exceptional customer service and top-notch quality products. Individuals, companies and organizations looking for a quality provider of affordable wholesale drawstring gift bags will appreciate our premier line of bulk gift bags which State Line Bag Company is happy to print or personalize according to your needs. To learn more about our high end wholesale drawstring bags just give us a call. Many suppliers of drawstring gift bags you find online are focused solely on profit rather than customer satisfaction; because of this, they often provide inferior quality products in order to sell in bulk quantities while maintaining healthy profits. At State Line Bag Co. our top priority is to ensure customers are totally satisfied with their wholesale drawstring bags purchase and equally happy with our price. At State Line Bag Company we provide customers small and large with bulk gift bags that can be personalized by our creative staff for those who desire a more personal touch for their retail store or other use. Our drawstring gift bags are left plain so that you can use them however you like or add a personal touch. We enjoy working personally with customers in an effort to deliver exactly what you need! Whether you are looking for small bulk gift bags or drawstring gift bags that are larger and more spacious, State Line Bag Company provides sizes ranging from 2" x 3" to 16" x 20" depending on material (cotton muslin, burlap, etc.). 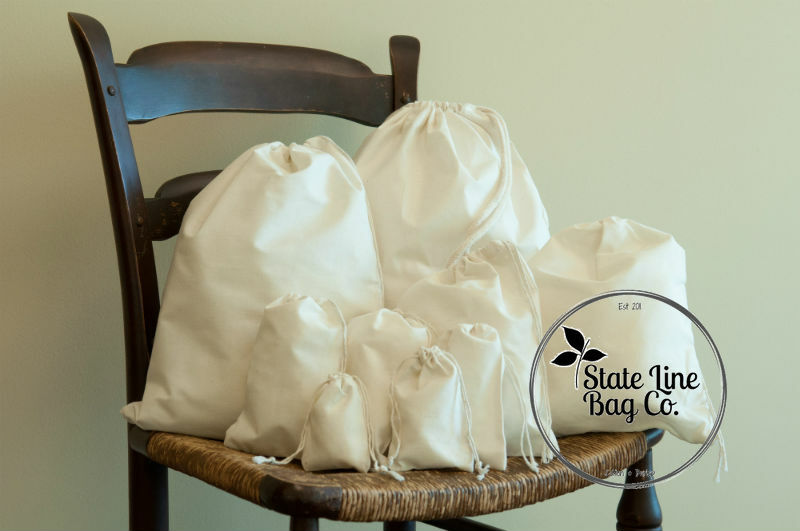 For all of your wholesale and bulk drawstring gift bag needs, count on State Line Bag Co. to deliver beyond your expectations. Contact our team today by emailing us at https://statelinebag.com/contact-us or call/text (913) 269-6404.